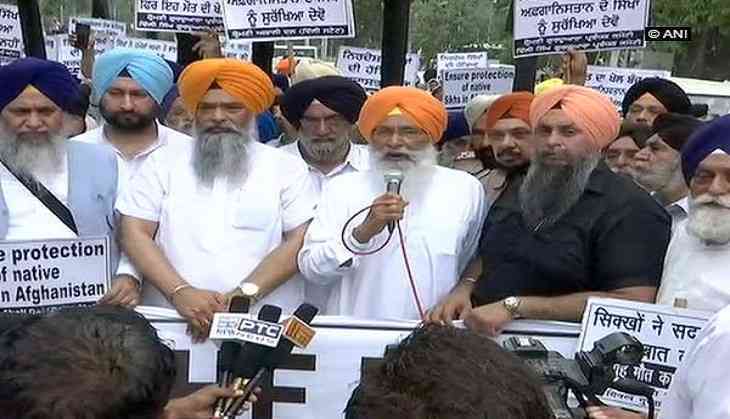 Members of Shiromani Akali Dal and Shiromani Gurdwara Parbandhak Committee on Tuesday staged a protest outside Afghanistan Embassy in Delhi, condemning the Jalalabad attack. On Sunday, a suicide bombing in eastern Afghanistan's Jalalabad city killed at least 19 people, mostly Sikhs and Hindus. Demanding protection for Sikh citizens in the troubled country, one of the protesters said the community stands with the people living in Afghanistan. "We request the Afghanistan government to protect our people living there. The casualties should be compensated by the Afghanistan government. We request the Indian government to provide citizenship to our people relocating to India," the protester told ANI. According to various media reports, some members of the minority Sikh community in Afghanistan, are mulling to move to neighbouring India after the deadly attack. A Sikh protestor, who spent some years in Kabul and came to India 20 years ago, said that the religious minority spends miserable life in Afghanistan. One of the protesters held a placard that read, "Sikhs are the Ambassadors of peace across globe, why killing of innocent Sikhs?" Sunday's bombing has rattled the Sikh community all over the world. Special prayers and 'ardas' are being organised in Gurudwaras. India also condemned the attack. "We strongly condemn the henious and cowardly terrorist attack in #Jalalabad today evening which resulted in the death of 20 innocent Afghans, including 10 members of the Afghan Sikh Community, and injured more than 20 persons," tweeted the Indian Embassy in Afghanistan. Punjab Chief Minister Captain Amarinder Singh extended help to the victims of the blast. The Chief Minister called upon the global community to come together to fight against the "barbaric forces of terror."